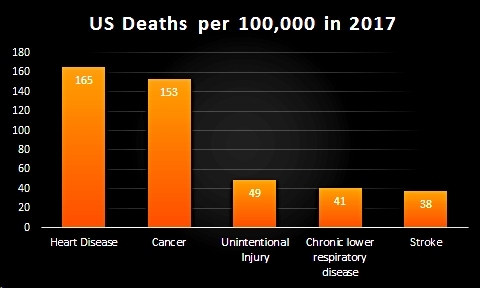 What are the leading causes of death in the United States? Based on what you have read or learned from news sources, what did you expect to see in the top five? If you thought of one that is missing, perhaps it is in the top 10. Still, when you look at the numbers, you may be surprised to learn how few people die in a given year, given the size of the US population. My point is that we ought to examine total data instaed of being guided by news stories when we want to understand a health or social condition. According to the Centers for Disease Control and Prevention, the five leading causes of death in 2017 were heart disease, cancer, unintentional injury, chronic lower respiratory disease, and stroke. The report includes more but I chose the top five based on the deaths per 100,000 U.S. standard population. 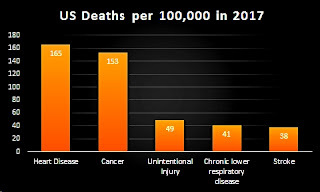 When you add the five numbers, you find the top five causes of death accounted for 445 people out of 100,000 people. Thus, less than 1 percent of the population died from the top five causes. The chart illustrates a helpful way to report data. Instead of reporting percentages, just give the numbers of people for condition X in relationship to a population. In this case, the relevant population is Americans (actually an estimate of the U.S. population based on the 2010 census). It is usually better to report data in terms of how many people with condition X out of 100 people, but as you can see, out of a sample of 100 people, we might have no dead people. And, fewer than 2 people died of these causes out of 1,000 people. So, it is important to select a population size that makes sense in terms of the available data. I would like to know how many people died in the United States. It just seems to make sense. If you are going to tell me how many people died out of some portion of the population, why not tell me the total figure? Interestingly, there is a total death figure for 2016, which is 2,744,248. That gives us a death rate of 849.3 people out of 100,000 population. The total population estimate for 2016 is 323,071,342. So, less than 1% of the population died in 2016. I would also like to know how many people died out of 100,000 people in 2017. The online figure is 731.9 per 100,000 so I will fix that fraction of a person and say 732 people out of 100,000. The 2018 CDC report tells us that 2,813, 503 deaths were registered. I see that they only know about registered deaths. Presumably, people could die and not be registered. so, it is good to pay attention to the details. They don't tell us how many people are in their estimate of the population-- the last census was in 2010. But they did say that they estimated the 2017 population based on 2010 census data. I did a search and found a census table estimate for 2017 = 327, 147, 121, according to the Census.gov website. The statisticians are pretty good, but it is important to know, we are dealing with estimates. We really don't know how many people died in the USA in 2017. Still, I bet the numbers are good estimates. I don't require absolute certainty when it comes to data about human beings. Anyway, if you are interested, you could estimate the number of people who died in 2017 or, you can wait until the data are provided. Another useful lesson to note here is the lack of scary headlines. We just have the facts reported in a responsible way. There's no news media writer telling us about this epidemic or another. We know that less than 1 out of 100 people died in 2016 (849 out of 100,000 rounded). If a person had 1,000 friends on social media then, 8 or 9 might have died if, and only if, the friends were similar in age and other relevant variables to people in the general U.S. population. My guess is, any friendship group probably does not represent a proportionate sample of the US population so, we will need to be careful in generalizing about all people based on our friendship group. It is truly sad for loving family members when people die of any cause. When we look at the total population, we see that even for the leading causes, not many of us die every year. Of course, healthcare personnel and other decision-makers ought to pay attention to trends--especially when we can do something about a particular cause of death. If you were going to say we have an epidemic based on the number of people dying, what figure would you say is worthy of the term epidemic? The dictionaries are not helpful because they refer to a "widespread" problem such as a disease. Truly, 1% of almost 330 million people is a lot of human beings. The number of people who did not die is of course the reverse so, more than 99%. We are wise to keep total figures in mind when we want to truly understand the scope of a particular cause of death or other social concern. Perhaps you already know this? It is a deceptive practice. Suppose one person died after taking drug XYZ this year. Then, next year two people died after taking the same drug. Two people out of thousands or millions is a very small number, but the increase in deaths equals 100%! We do not know how many people took drug XYZ and are living quite happily! It's good to be careful how people are reporting data. We really need to know all the relevant data when making informed decisions. Corrections and helpful comments are welcome. So many people are creating surveys in schools, government agencies, and major corporations. Some are better than others. 1 Stay focused on your goal. Avoid asking everything you can think of on a subject. Unfortunately, I've been on project teams that would not heed this advice. Participants get frustrated and leave surveys incomplete. 2 Ask only one question at a time. Have someone look at your items to see if they are confused about what you are asking. Know your audience and how they use language. Again, ask a few people to check your wording. Some participants will drop out of your survey when they identify misspelled words, common punctuation errors, and problems of grammar. 5 Cover all possible answers. If you aren't sure you have listed every option, then add an "other" option with a place to write in another response. This may lessen the frustration of participants who don't agree with the available options. 6 Provide a reason and time information for long surveys. Justify why it is important for people to spend a long time answering your questions. And give them a time estimate based on how long others have taken to complete your survey. Provide contact information and a link to your school or business so people have a way of verifying your credibility. People will help students, but let them know your professor's name and the name of your school. Learn more about creating surveys for business and school in CREATING SURVEYS. Download a FREE sample from AMAZON to see if it meets your needs. See why professors recommend Creating Surveys to undergraduate and graduate students.